my tentacles arrived and i did my first testing with them today. all works very fine, exept the xml-imort in premiere pro CC2014 as well the new cc2015. i checkt this on two different computers. i attached the error message. the import via fcp7 works fine. then export a xml 5 from fcp7 and import in premiere works, but nice were a direkt import n premiere. has anybody the same problem? or more better: has anybody fixed it? 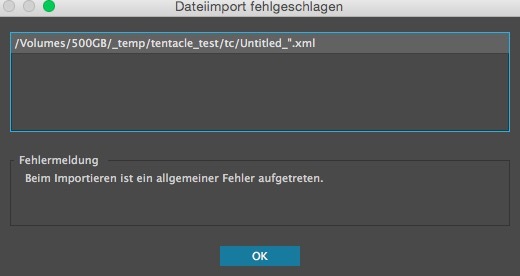 perhaps i forgot this: the xml-file was created with tentaclesync-software, of course.